Have you ever wondered if we are living in the time of the last days the apostle Paul wrote about in his second letter (epistle) to Timothy? In the 3rd chapter, he gave a more detailed description regarding the evil nature of people's character in those days. The odd thing about them, however, according to verse 5, is that although these people would deny it's power, they would have a form of godliness nonetheless. Paul added that true believers should have nothing to do with them. Of course, I don't believe that includes our efforts to try to reach them with the gospel. It just dawned on me recently that you can find these people, so aptly described in the first few verses of Chapter three, in a newspaper or website's section where the readers express their opinion about the article or news item just posted. Why do I say that? Because, among the character traits Paul listed are: "lovers of themselves, lovers of money,boastful, proud, abusive, ungrateful, unholy, without love, unforgiving, slanderous, without self-control, brutal, rash, conceited, and lovers of pleasure rather than lovers of God." Check out these reader forums when you have a chance. 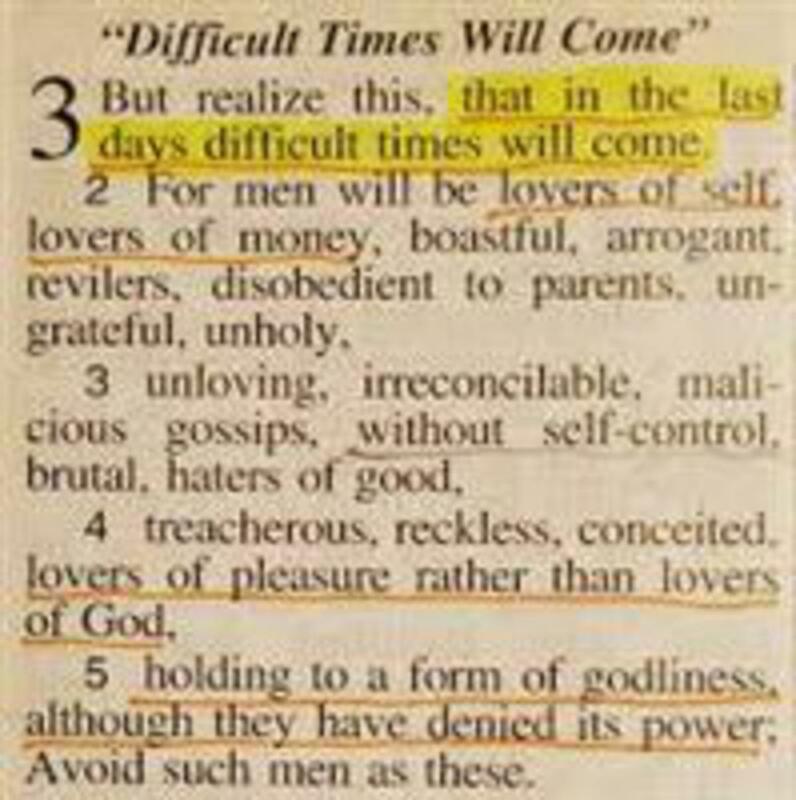 I bet you will easily see these character traits in the words and ways these opinion givers express themselves and perhaps you will agree that the last days are here. After all, Jesus, in dealing with His hypocritical religious opponents, told them: You brood of vipers,how can you who are evil say anything good? For out of the overflow of the heart the mouth speaks. (Matthew 12:34) Simply put, the words that come out of people's mouths reveal what is really in their heart. Remember that Paul said they would have a form of godliness? Well, in one forum a man who claimed he was a Christian reproved one who claimed to be an atheist with these choice words: "You are a (expletive) blankety blank moron." Was he not being abusive, unholy, without love or self-control, unforgiving, and brutal? Do you think he was a true follower of Christ? In cases like these, I sometimes get tempted to reply to people like these and then I remember that its better not to. If you, as I am, are convinced that we are living in the perilous last days, then I think it is also an exiting time because Christ's return is imminent. If you are in Christ, don't let these times frighten or discourage you. After all, our best days are just up ahead. Memory verse for the week: (Hebrews 13:5 KJV) "Let your conversation be without covetousness; and be content with such things as ye have : for He hath said , I will never leave thee, nor forsake thee."